With its deep orange hue, dollops of soft white goat cheese, and nasturtium flowers, this appetizer is almost too pretty to eat. But your taste buds will be happy when you bite into this unusual blend of flavors and textures created by Chef Chris MacGillivray of The Squeaky Bean restaurant located in Denver. If you can spring for balsamic vinegar that’s been aged for at least eight years, you will notice the added depth of flavor. 1. Shave squash very thinly on a mandolin. 2. Mix olive oil and verjus. 3. Toss pumpkin seeds with 1 teaspoon of olive oil and curry powder; toast at 350°F for 8–10 minutes. 4. 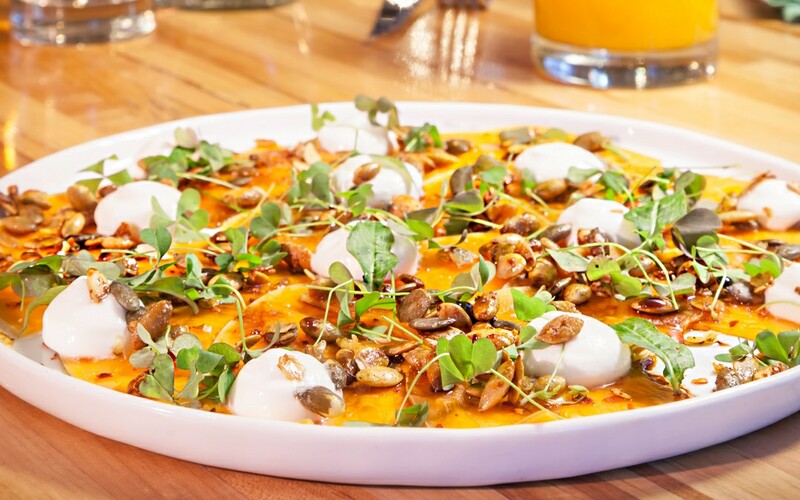 Shingle squash onto four plates, brush with balsamic vinegar, sprinkle with pumpkin seeds, goat cheese, some nice sea salt, a few drops of balsamic, and top with a few nasturtiums.